"Psychologist Scarlet, a childhood survivor of the Chernobyl nuclear explosion, draws on the techniques of acceptance and commitment therapy (ACT) in this innovative approach to helping readers with emotional and psychological difficulties." "Eye-catching art and a focus on setting simple, achievable daily goals, makes this a promising alternative to more conventional self-help programs." A hero's journey always begins with a struggle--what's yours? 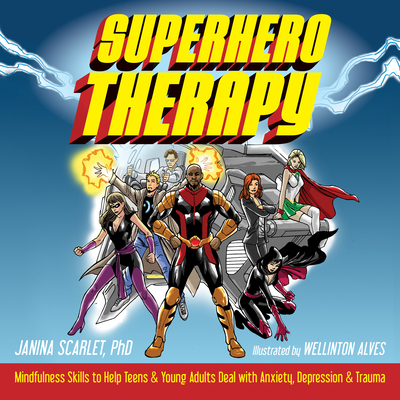 For the first time ever, psychologist Janina Scarlet and Marvel and DC Comics illustrator Wellinton Alves join forces to create Superhero Therapy--a dynamic, illustrated introduction to acceptance and commitment therapy (ACT) to help you vanquish your inner monsters, explore your unique superpowers, and become a Superhero questing for what matters to you. Haven't you ever wanted to be a Superhero? Wished that you could have amazing superpowers, such as super-strength, the ability to fly, or the ability to heal people? Or maybe you wished that you could travel through time and space, enjoying the many adventures that you would encounter along the way? Many of us wish we had special abilities to help us navigate through life--especially when super villains like anxiety, depression, anger, or shame make an appearance. This fun, unique, and "outside-the-box" self-help guide provides everything you need to begin your very own superhero training using evidence-based ACT and mindfulness skills. Within these colorful pages, you'll team up with a group of troubled heroes--inspired by both fictional characters and real-life people--enlisted at the Superhero Training Academy. By learning to face up to their inner villains and monsters, these characters will inspire you to overcome your problems as well. When you're finished, you'll have a slew of new tools you can use--like mindfulness, self-compassion, and values--to help you conquer whatever life throws your way. Sometimes life is hard, and it takes super inner super strength to succeed and reach your goals. With this fun and unique guide under your belt, nothing will stand in your way. Janina Scarlet, PhD, studied at The City University of New York (CUNY) with a focus on behavioral neuroscience. She completed her postdoctoral training at the Veterans Medical Research Foundation, where she got an opportunity to treat active-duty service members with post-traumatic stress disorder (PTSD). She uses superhero therapy to help patients with anxiety, depression, chronic pain, and PTSD at The Center for Stress and Anxiety Management. Scarlet also teaches at Alliant International University, and resides in San Diego, CA. Illustrator Wellinton Alves is well-known for his artwork for Marvel and DC Comics, including multiple issues of Avengers, Spider-Man, He-Man, Nightwing, and many others. He resides in Brazil.